Hot cross buns are for life, not just for Easter. That’s totally not a saying, but it definitely should be. They’re just ridiculously delicious. Take a roll, sweeten it, add spices, fruit and a sticky glaze – hey presto you have a hit on your hands. And if you’re lucky you’ll get a hot cross bun bread and butter pudding as well, you know you want one. 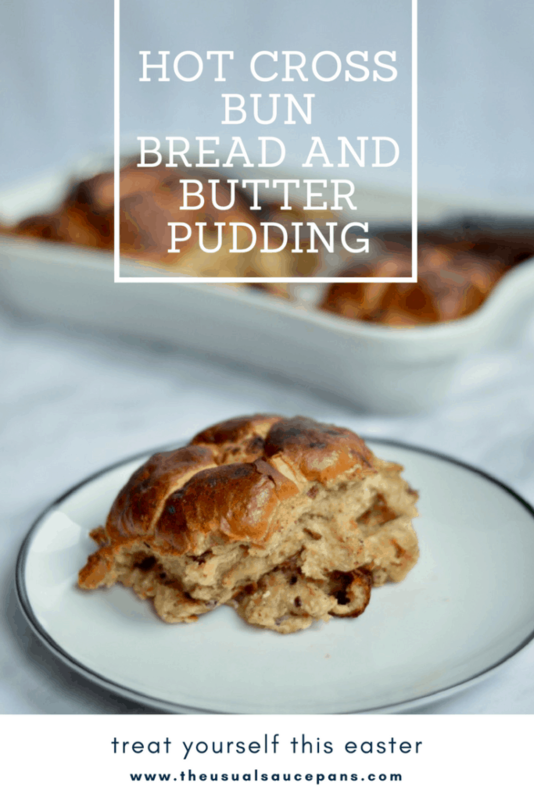 Yeah, a hot cross bun bread and butter pudding. It’s not just as delicious as you’re probably thinking, it’s better than that. Easter feels like a bit of a weird time of year to me – I think it’s because it moves about so much, it never really feels like something dependable. But when an occasion presents itself as a long weekend in which to enjoy some of the amazing spring produce that’s coming in to our lives round about now, then it’s an opportunity not to be missed. OK sure, I’ve muddled the original meaning somewhere along the way, but this is how my Easter is – delicious. Bread and butter puddings are possibly not the first thing you associate with Easter (but you don’t associate it with croissants either, and that totally works), but since they are absolutely delicious and winter seems to be going on longer than any of us can be bothered with this year, it seems like the right time to bring this all together into one delicious dessert. There’s something about a big baked dish of bread and butter pudding that makes me think about big Sunday dinners as a kid, and whilst this recipe isn’t picky about the day of the week you make it on, it does really feel like it’s one for getting the whole gang round the table for. 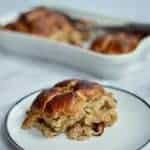 Flavour-wise, the hot cross bun bread and butter pudding is quite different to others that I’ve made – including my favourite-until-now chocolate and croissant version. 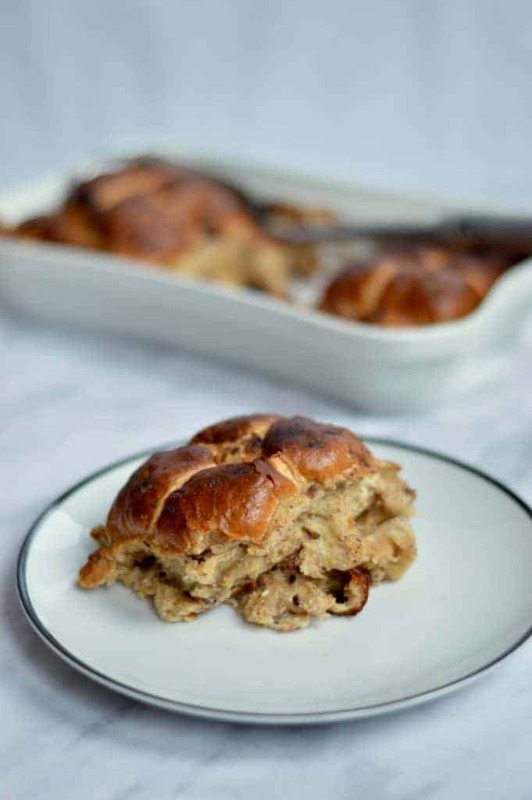 There’s more spice to this one with a generous helping of cinnamon in the sauce, a little bit of lemon juice and zest throughout it and the fruit from the hot cross buns themselves. Together they make what is quite a heavy dessert that little bit lighter. 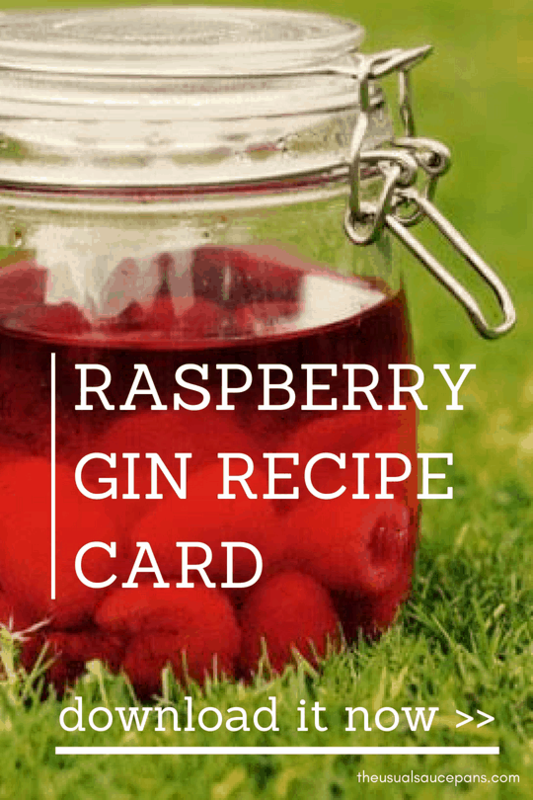 In an off-character note, I didn’t add any sort of alcohol into this recipe, but that doesn’t mean you can’t. I’d recommend either an orange liqueur or something creamy. 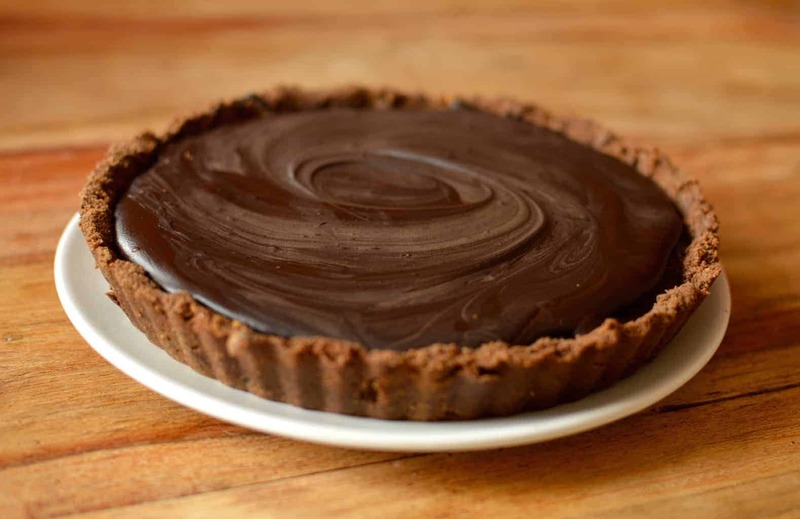 Serve it with a bit more cream, or lashings of custard should you so desire. Oh my word, we all need a portion of this happiness in our lives. It’s all about getting people round the table and sharing the Easter love. Or July love. Or October. It doesn’t matter when you make this, it’s the making it that’s important. Take your hot cross buns, cut them in half and butter generously. Put three of the ‘tops’ to one side and then rip up the rest of the hot cross buns into little chunks. Butter an oven-proof dish and put all the the chunks of bun into the dish, they should be quite tightly packed and a few chunks deep. Get a jug and into it you put the milk, cream, vanilla and caster sugar; whisk this all together, then crack in the eggs, tip in the cinnamon and whisk until you have a smooth sauce. 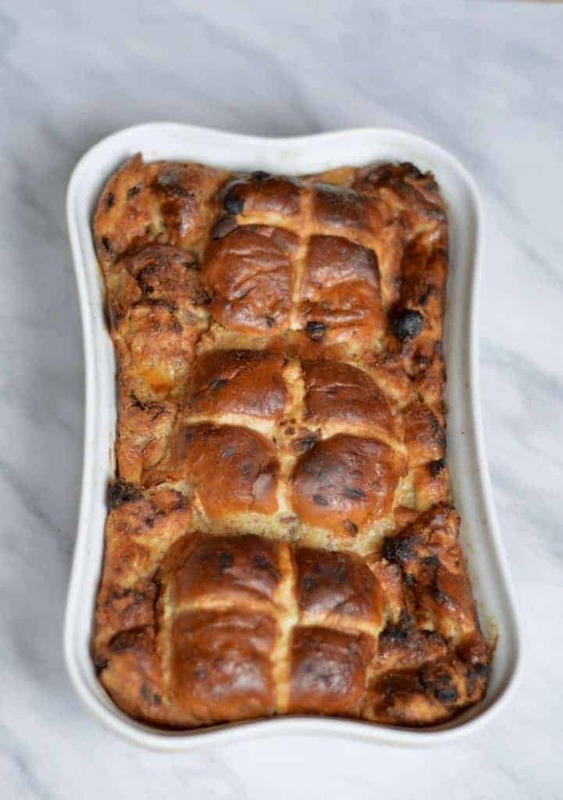 Pour the sauce liberally over the hot cross bun pieces – don’t worry if they look like they’re starting to float a little. Add the ‘tops’ on to the dish and push them down a little so they start to soak up some of the sauce on the top. Pour some more of the sauce over the top. You might not use all the sauce. Cover and let it sit for 30 minutes so the sauce can soak in. Preheat the oven to 170ºC. Put the dish into the centre of the oven and bake for 30 to 40 minutes, until the sauce is set and the top is golden.